If you decided to learn how to tie just one saltwater fishing knot - make sure it's the Uni-Knot! As one of the easiest fishing knots to tie, and with a breaking strength only slightly less than the line it 's tied in, you can use it to attach the line to your swivels, hooks, lures (although the Rapala Knot is a better knot to use for lures) along with any other rigging hardware, and also to join two lines together. 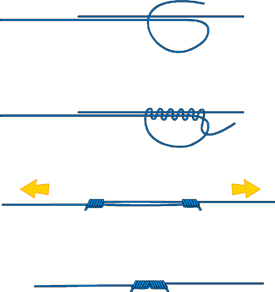 As such, many sea anglers tie two uni-knots in tandem for connecting their mainline to their leader as shown further down this page. It's ideal for use with mono and flourocarbon lines, and although it can be used with braid line, the braid knot would be a better choice. First, pass a line through the eye of the hook and form a loop as shown here. Then, with the knot now well consolidated, snip the end off close and pull on the line to slide it down towards the hook. And that's it, the finished knot, as it's tied for attaching the line to swivels, hooks and lures. The following tandem version is a simple way of joining two lines of similar diameters. Each line ties a Uni Knot around the other before the two knots are pulled together to complete the connection. In this form it's often called, for obvious reasons, the Leader Knot.